1 publications with the keyword "multitarget"
Through its ability to create situation awareness, multi-target target tracking is an extremely important capability for almost any kind of surveillance and tracking system. Many approaches have been proposed to address its inherent challenges. However, the majority of these approaches make two assumptions: the probability of detection and the clutter rate are constant. However, neither are likely to be true in practice. For example, as the projected size of a target becomes smaller as it moves further from the sensor, the probability of detection will decline. When target detection is carried out using templates, clutter rate will depend on how much the environment resembles the current target of interest. In this paper, we begin to investigate the impacts on these effects. Using a simulation environment inspired by the challenges of Wide Area Surveillance (WAS), we develop a state dependent formulation for probability of detection and clutter. 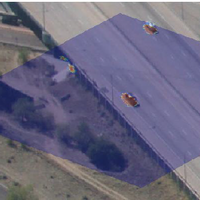 The impacts of these models are compared in a simulated urban environment populated by multiple vehicles and cursed with occlusions. The results show that accurate modelling the effects of occlusion and degradation in detection, significant improvements in performance can be obtained. A. Gning, W. T. L. Teacy, R. Pelapur, H. AliAkbarpour, K. Palaniappan, G. Seetharaman, and S. J. Julier. The effect of state dependent probability of detection in multitarget tracking applications. Proc. SPIE Conf. Geospatial InfoFusion and Video Analytics IV; and Motion Imagery for ISR and Situational Awareness II (Defense, Security and Sensing), volume 9089, 2014.